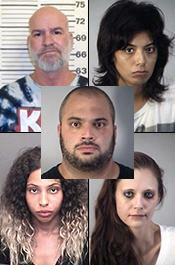 AUGUST 17--For today’s “Friday Photo Fun” game, readers must examine five mug shots and match each defendant with the alleged crime for which they were arrested. You can play today’s contest by clicking below. You’ll also find it as the latest post on our “Time Waster” page, where you can test your sleuthing skills by playing 400+ archived match games.